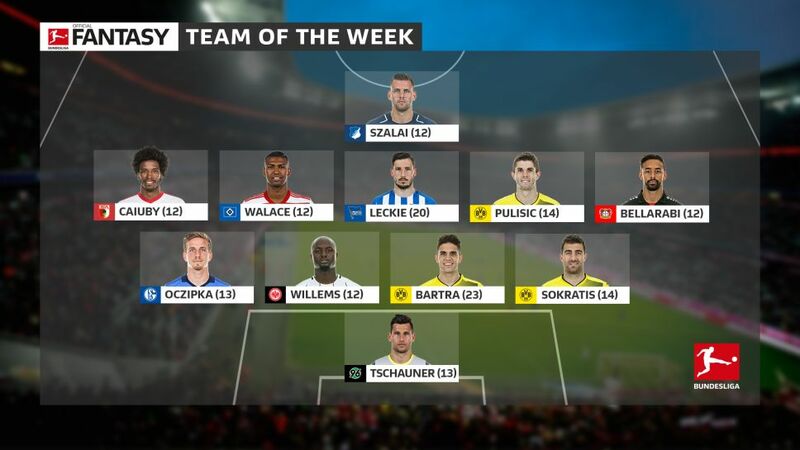 A brace for new dad Leckie, Pulisic shines with goal and assist and Bartra's incredible strike from defence - what an opening weekend in the Bundesliga it was. It might have been only a second Bundesliga appearance in 12 years for Philipp Tschauner, but it was well worth the wait. The 31-year-old stopper made an impressive five saves against the Mainz attack, helping the promoted side to a fine victory at the first time of asking on their return to the top flight. Borussia Dortmund captain Sokratis continued where he left off last season with another fine performance. With 112 touches, the Greece centre-back enjoyed more possession than any other player. Another authoritative display that earned him a place in season's first select XI. The star player of the weekend by bringing in 23 points, Bartra's brilliant finish in Dortmund's 3-0 win in Wolfsburg was his maiden Bundesliga goal. The Spaniard's efforts also brought Borussia a clean sheet and returned Die Schwarzgelben to the top of the Bundesliga table for the first time since Matchday 5 of the 2015/16 campaign. It was a particularly emotional afternoon for Bartra, who dedicated his goal to the victims of the recent Barcelona attack - a city that was the 26-year-old's home until last year. Signed by Eintracht Frankfurt to replace the Schalke-bound Bastian Oczipka, Netherlands left-back Willems was a rock in the Frankfurt defence, as the Eagles began the season with a clean sheet in Freiburg. Signed from PSV Eindhoven, the 23-year-old also won more challenges than any other player on the pitch in an eye-catching start to life in the Bundesliga. It was an excellent home debut for Schalke's new left wing-back, brought in as a replacement for the departed Sead Kolasinac. Oczipka wasted little time in endearing himself to the Gelsenkirchen faithful, creating four chances for the Royal Blue front-line in Saturday evening's statement 2-0 win over RB Leipzig, as well as enjoying more touches of the ball than any other Schalke player. Much like his side, Karim Bellarabi put in a lively, stirring performance in Munich on Matchday 1. Although Leverkusen slipped to a 3-1 defeat at the Allianz Arena, the winger managed to send in six shots on goal, keeping Bayern Munich custodian Sven Ulreich honest throughout. The Germany international was a constant threat and - positively for Bayer fans - looks back to his best this term after his injury troubles. Fresh from scoring Dortmund's first competitive goal of the season in the Supercup a week prior, Christian Pulisic underlined his growing reputation by scoring the first goal of the Bundesliga season for Peter Bosz's youthful side, setting Die Schwarzgelben on the way to a 3-0 triumph in Wolfsburg. Growing in stature in the continued absence of fellow widemen Marco Reus and Ousmane Dembele, the American - still only 18 - also picked up an assist when he set Pierre-Emerick Aubameyang up for BVB's third. Hertha summer signing Methew Leckie announced himself in style to the Olympiastadion faithful: the Australian speedster netted both goals as the Berliners beat promoted Stuttgart by a comfortable 2-0 scoreline. Signed from relegated Ingolstadt, Leckie's strikes marked his first Bundesliga brace and rounded off a perfect week: the 26-year-old had also just become a father. Walace underlined his increasingly influential role within the Hamburg midfield by recording a maiden Bundesliga assist, setting up Nicolai Müller to score the only goal of the 1-0 win over Augsburg on Matchday 1. The 22-year-old - a gold medallist at the 2016 Olympics - also fired in two shots and won ten challenges in a dominant display. Another Brazilian to impress on a samba-fuelled afternoon in the Port City. Augsburg may have lost, but Caiuby could certainly bear no blame for the defeat. The attacking all-reounder was everywhere in his side's ultimately doomed cause, winning 27 of his 44 challenges - the most of anyone at the Volksparkstadion - and firing in three efforts on goal. Under pressure for his place up front following the arrival of Serge Gnabry and form of Mark Uth, it was a typically imposing performance from Adam Szalai that underlined his worth to Julian Nagelsmann's Hoffenheim. The Hungarian striker attempted the most challenges (31) of anyone on the pitch in his side's 1-0 win against Werder Bremen, before setting up Andrej Kramaric's 84th-minute winner.